The EL3351 analog input terminal permits direct connection of a resistor bridge. 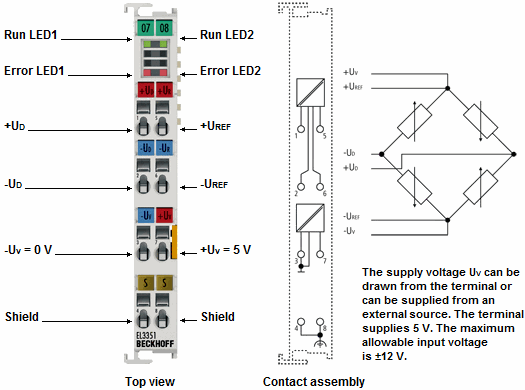 The bridge voltage, UD, and the supply voltage, UREF, to the bridge are digitised with a 16 bit resolution, and are transmitted along an electrically isolated channel to the supervising automation system. The input channels are available in the form of two 16 bit values for further processing. The resulting measurement can be calculated from the formula: measurement = UD/UREF. Precise acquisition of the supply voltage along with the bridge voltage compensates for long-term and temperature drift.